Why a stay in the ICU can leave patients worse off – This PBS documentary explores how patients are changed, physically and emotionally, by their ICU experience, and how some doctors are trying to change the ICU environment to get patients out of hospital faster. Other Decision Aids – The Ottawa Hospital Research Institute has a website with information and tools for a number of specific conditions to help people make decisions about treatment. Advance Care Planning – This website can help you learn more about advance care planning, a process of thinking about and sharing wishes for future health care. You can also fill out an online advance care planning workbook at www.myspeakupplan.ca. Society of Critical Care Medicine – this website has information for patients and families about critical care, the ICU and treatments. ACP Conversations – “Conversations” features real-life stories and thoughts from researchers, health professionals and family members about sharing our thoughts for end-of-life care. Ain’t the Way to Die – by ZDoggMD, this video offers an easy way to break the ice and start conversations about end-of-life issues. We value helping people make more informed decisions regarding their medical treatments. This PDF workbook is free and accessible for all to download to print and distribute in their ICU. It contains much of the same content of this website but you can make this important information available in print. 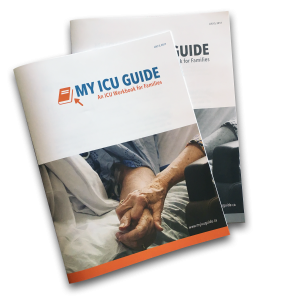 You can you use the printed copy to create awareness of the website and help your families understand the ins and outs of an ICU. This printable pamphlet will refer family members to the website to fill out the ICU Questionnaire. The workbook PDF has been formatted for any print shop and can be printed in both color and black and white. The pages will seem out of order on the PDF but when printed as a book the page order aligns correctly.